Waimea Bay is located in Hale’iwa on the North Shore of O‘ahu in the Hawaiian Islands at the mouth of the Waimea River. Waimea Valley extends behind Waimea Bay. Waimea means “Red Water” in Hawaiian. Captain Clerke aboard HMS Resolution stopped at Waimea Bay on 28 February 1779. Clerke had shortly before taken command of the ship after Capt. James Cook was killed at Kealakekua Bay on 14 February, and was leaving the islands for the North Pacific. It was the only O‘ahu anchorage which this expedition visited. The site was densely populated at the time, and remains of a heiau (Hawaiian temple) can still be found above the bay. Here Capt. Vancouver is rumored to have been killed and sacrificed by cannibal kahunas and offered on the stone altar that can be seen in Puu O Mahuka Heiau above Waimea Bay. You can access the park by driving up Pupukea Road and taking the first right through the cattle guard. A short hike down the hill brings you to a spectacular view of the sunset and the North Shore towards the Waianae Mountain range. In winter, Waimea and other North Shore locations such as Pipeline and Sunset Beach host a number of surfing contests because of the large waves found here. These waves are created by winter storms in the North Pacific, and their arrival on O‘ahu’s North Shore are typically forecasted accurately several days in advance. In summer, Waimea typically has clear and calm water. The well known Big wave invitational Surfing Classic meet “Quiksilver in memory of Eddie Aikau” takes place in this point to honour the legendary surfer and the first lifeguard of the North Shore of Oahu. Since its inception in 1984, the tournament has only been held seven times, due to a precondition that there be waves at least 20 feet high at Waimea Bay. The most recent tournament was in December 2004, when waves in the bay reached 30 to 50 feet high. In Summer, Waimea Bay is a playground of fun for freedivers, S.C.U.B.A. divers, and those who desire to jump off Queen’s Leap – a rock that is perfectly positioned in the bay. (at your own risk!) The Bay as well as Three Tables, Pupukea, & Shark’s Cove are protected waters. The diversity of life in these waters is astounding. Edward Ryan Makua Hanai Aikau (May 4, 1946 – March 17, 1978) was a well-known Hawaiian lifeguard and surfer. As the first lifeguard at Waimea Bay on the island of Oahu, he saved many lives and became well known as a big-wave surfer in his own right. Born on the island of Maui, Aikau later moved to O‘ahu with his family in 1959. In 1968, he became the first lifeguard hired by the City & County of Honolulu to work on the North Shore. Not one life was lost while he served as lifeguard of Waimea Bay, as he braved surf that often reached 20 feet high or more. He became very famous for surfing the big Hawaiian surf and won several surfing awards including the 1977 Duke Kahanamoku Invitational Surfing Championship. In 1978, the Polynesian Voyaging Society was seeking volunteers for a 30-day, 2500 mile journey to follow the ancient route of the Polynesian migration between the Hawaiian and Tahitian island chains. At 31 years of age, Aikau joined the voyage as a crew member. The Hokule’a left the Hawaiian islands on March 16, 1978. The double-hulled voyaging canoe developed a leak in one of the hulls and later capsized about twelve miles south of the island of Molokai. In an attempt to get to land to get help, Aikau paddled toward Lanai on his surfboard. Although the rest of the crew was soon rescued by the U.S. Coast Guard, Aikau was never seen again. 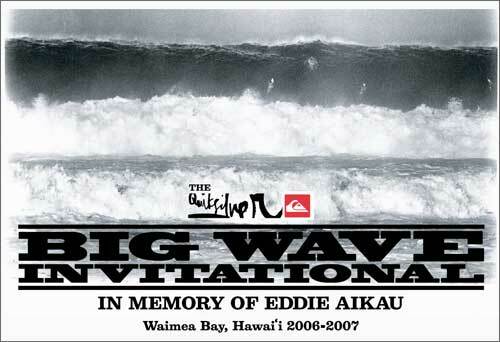 In Aikau‘s honor, the surfwear company Quiksilver sponsors the “Eddie Aikau Invitational Surf Contest“. Since its inception in 1984, the tournament has only been held seven times, due to a precondition that there be waves at least 20 feet high at Waimea Bay. The most recent tournament was in December 2004, when waves in the bay reached 30 to 50 feet high. Another variation of the aforementioned popular phrase is “Eddie would tow.” This phrase is in reference to the method of big wave surfing in which one surfer must accelerate another surfer (the former on a jet ski, the latter towed on a surfboard) to the speed of a large, fast wave. The person “towing” on the jet ski (in this case, Eddie) is viewed as being a necessary (and generous) part of the operation, as they do not surf, but rather help others to surf the big waves. It is also partially in response to the controversy over the “unnaturalness” of tow-in surfing; many surfers feel that being towed in to a wave, as opposed to paddling, is against the spirit of the sport.